Bryan Atchley’s determination and dedication to community service landed him a job as Sevierville mayor 23 years ago. He was named “Mayor of the Year” by the Tennessee Municipal League in 2013, and his mother, a beloved Sevier County school teacher, was among the first inductees into the Sevier County Education Hall of Fame. Her grandson, Bryan Atchley, Jr., continues the tradition as a teacher and Athletic Director at the high school today. On those rare occasions when the Atchleys have to rely on the care of others, they say it’s good to know there’s a trustworthy source of care nearby. LeConte Medical Center and its predecessor Fort Sanders Sevier have offered more than 50 years of comprehensive medical care to the Atchley family. On Jan. 21, 2018 Emma Atchley was admitted to LeConte Medical Center to be treated for a virus. “I was getting along pretty good, and all at once things went wrong,” says Emma Atchley. Mayor Atchley has a long-standing connection to the hospital, having encouraged the sale of city property to Covenant Health for LeConte’s construction. He also took part in all the ceremonies that led to doors opening for the first patients in 2010. So although Mayor Atchley was concerned about his mother, he was confident she would be well taken care of at LeConte Medical Center. Then something unexpected happened. Mayor Atchley knew his son had planned to go to an urgent care clinic to be checked out for abdominal pain, but didn’t know the clinic visit was going to turn into a hospital stay. When Bryan Atchley Jr. woke up on a Saturday morning with severe pain in his side, he waited a couple of days before having it checked out. He was determined not to miss work – or national championship football on TV. Back at school on Monday morning, Bryan Jr. decided to drop in on the school nurse. After a brief examination, she told him he likely either had kidney stones or appendicitis. With the characteristic Atchley determination, Bryan Jr. got up and walked out of the nurse’s office with the full intention of finishing his workday. He jokes that the school nurse had to threaten to call his wife before he would agree to make time to visit an urgent care clinic. At the clinic, it became clear that he needed to go to a hospital, but as athletic director, Bryan Jr. was expected to be at a basketball game that evening on top of other duties he needed to carry out. He went to LeConte Medical Center, but he took his work with him. “They actually had to pull the phone out of my hand twice,” Bryan Jr. says. Mayor Atchley remembers how much his son was determined to take care of things at work before taking care of himself. The trip to the hospital may have seemed like a mere inconvenience at first, but it wasn’t long till Bryan Jr. realized how lucky he was to have been there. Once Bryan Jr. set work aside, he says he received care that was excellent before, during and after his appendectomy. He also found some unexpected comfort as he came across medical staff members he had grown up with, or people he had connected with during his career at the school. Getting the best of care administered by trusted friends from his community was a great feeling. But Bryan Jr. also noticed that the local folks weren’t the only ones being treated well. A two-time cancer survivor, Mayor Atchley knows how hard it is to sideline work for the sake of health and safety. As an administrator with Sevierville Health Rehabilitation, he knows the importance of compassionate care. During a week that at times seemed out of control, Mayor Atchley was secure in the knowledge that his son was receiving the best care, and that taking Emma Atchley to LeConte Medical Center was the right choice. 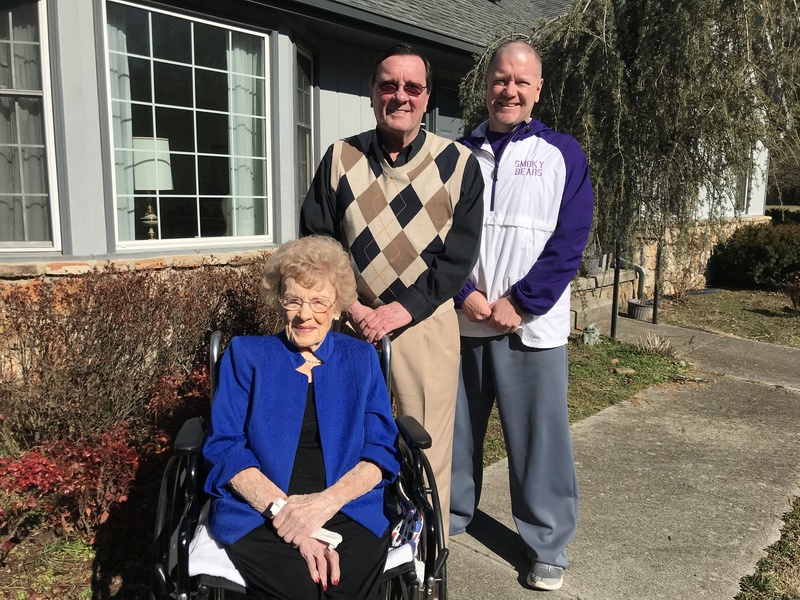 On a sunny day at Emma Atchley’s home the three sit together and recall that unexpected week at LeConte Medical Center. Emma recalls Fort Sanders Sevier in its earliest facilities. Bryan Jr. talks about the feeling of being treated by people from his home community. Mayor Atchley remembers attending groundbreaking and ribbon cutting ceremonies for LeConte Medical Center. All three are in agreement that they can count on LeConte Medical Center to take care of them on those occasions when that characteristic Atchley determination isn’t quite enough to get the job done. Bryan Jr. is grateful for the care he didn’t want to slow down for, but knew he had to have. “They treated me top notch, he says. I could not have asked for a better experience.